Recently, we have had the opportunity to work with an incredible brand-new product from Memoria Press. Something that I have really wanted to do, but haven't been at all consistent with. Music Appreciation I is simply terrific. This program is intended for grades 3-5, according to Memoria Press, but it has worked quite well with my 6th and 8th graders. I grew up with a lot of music. I played piano for years, played viola, sang in multiple choirs, and taught myself a bit about violin and cello. This was always something I wanted to pass along, but somehow it just hasn't happened. So working through this course was something I was excited about. 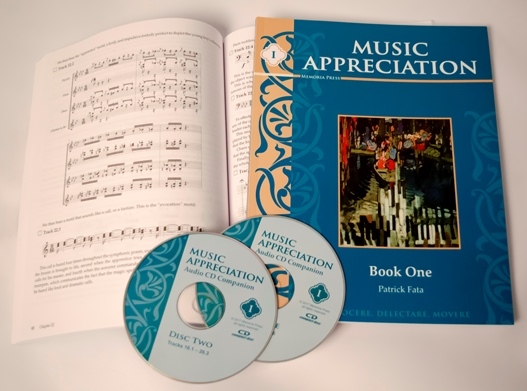 What you get for Music Appreciation I is a book and two audio CDs. On the website, there is a link to a YouTube playlist of the songs covered in this course. That playlist is wonderful just to listen to independent of actually working on the course. I'm listening to the list right now, as I write this review. This always helps to clear my head and regulate my breathing. I need to get more classical music in my life again. Anyway, back to the course! The course confused me at first, as there isn't a really straightforward description of how to use it. So I started at the beginning, and we have come up with something that works for us. Listen: we watch the YouTube video of the piece that is focused on for this lesson, such as Für Elise. The video is around 3:30. Most of the pieces are ones that my kids have heard before, but a few are ones they aren't terribly familiar with. A Little History: this section gives some information about the composer and/or the time period in which it was written. We read this aloud and discuss as we go. Musical Concept: this section talks about some aspect of music itself. In this lesson, we learn about the 12 musical notes and their names. There are seven tracks on the included CD that show things like scales and chords, with text to read in between the example tracks. About the Piece: this gets into some specific background on the piece of music itself, like just who was Elise? We also learn that this is a bagatelle, and we learn what makes up a bagatelle. This part has another three tracks on the CD that give a simplified version of the A, B, and C sections of this bagatelle. We learn that a rondo is arranged as ABACA. Facts to remember: we read through these brief notes that summarize the lesson. Listen again: we pull up the YouTube video again (and again, usually) and watch and listen, looking for the specific things we have been learning about. We follow this up by listening to the piece from other sources throughout the week. There are also tests that cover the material for four chapters at a time. We have not utilized these as much as we probably ought to. I do give them an oral quiz though. Some chapters have a section for Music History, which often discusses the musical period we are now in. Some chapters have more than one section for Musical Concept, for instance. In general, each lesson starts with a Listen section, and ends with Facts to Remember and Listen Again. There are other history and music theory sections in between. We are loving this. The material is presented pretty simply. It is not overwhelming, nor is it difficult. It also isn't too easy to be doing with older students. There are some fantastic photos included as well. The book goes roughly chronologically, starting with Handel, working through Vivaldi, Bach, before spending a pretty good amount of time on Mozart (both Wolfgang and his father) and Beethoven. Then you move on to Tchikovsky, Schubert, Brahms, Strauss, Wagner, Saint-Saëns, Massenet, Rimsky-Korsakov, Mussorgsky, Prokofiev, Dukas, Ravel, Copeland and Gershwin. There is also a Christmas lesson, and you end with The Star-Spangled Banner. Obviously, we're only on lesson 6 of 26, but in looking the list over, I only spotted one piece that I wasn't already familiar with. There is a pretty good mix of composers, and some truly excellent music included here. 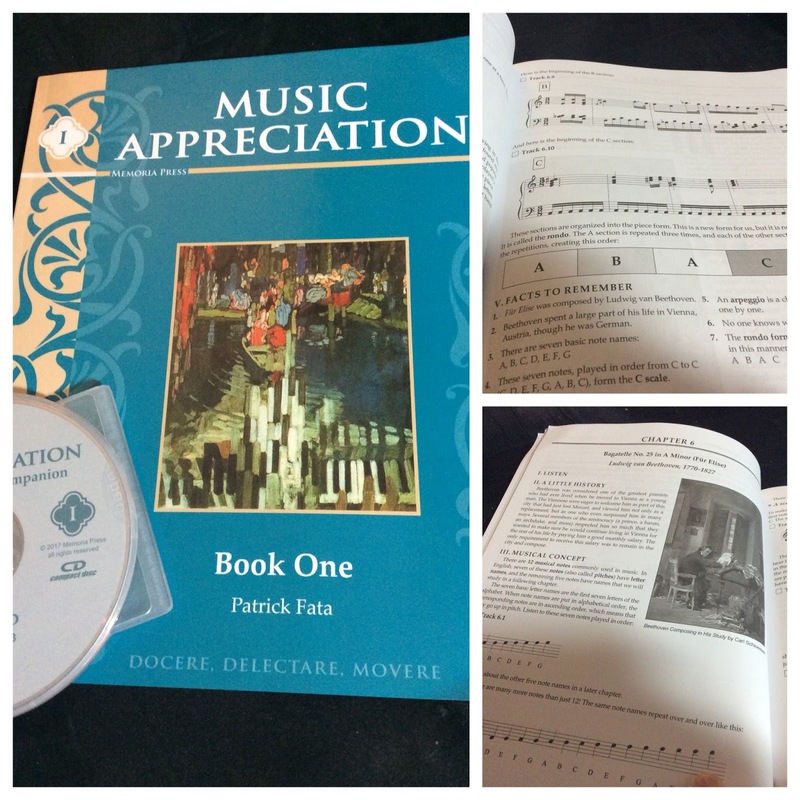 I dearly hope they are going to be coming out with Music Appreciation Book Two soon! Meanwhile, you can go check the Crew reviews to see some of the other products the Crew was able to review, like the brand-new Traditional Spelling program. I was THRILLED to see that they included not just Mozart the son, but the father too! Actually I was happy that most of my favorites were in this book and the selections were fabulous! I can't wait to study the Flight of the Bumblebee, Peter & the Wolf, the Sorcerer's Apprentice, and Bolero near the end of the book! I too am hoping they release book 2 before I finish with book 1! I was so thrilled with Memoria Press, we are using the Traditional Spelling I and my daughter LOVES it!! I think at the moment she is a bit young for this program but I am really hoping that when we can that we can incorporate this in our homeschool curriculum. We all love music and I absolutely love their approach to learning.